(2012) Conn-Selmer is the newest entity in merger’s of the musical instrument industry. It is a merger of Conn and Selmer. 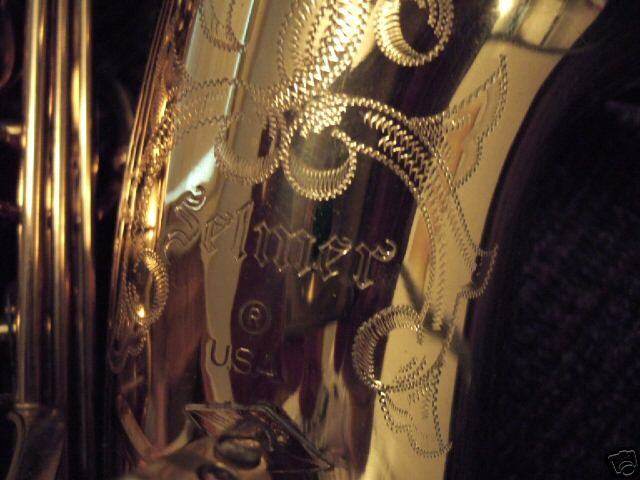 (my text from 2001) Selmer (USA) today imports and distributes Henri Selmer-Paris horns. They are two entities with one very close past. Alexandre Selmer, who is famous in the US (and shortly Paris) for his line of Alexandre clarinets came to the US and joined many renowned orchestras. He later started the Selmer USA company in 1904 to import his brothers line of saxophones to the US (Henri Selmer). Alexandre then hired George M. Bundy (a former student of his) to run the business and Alexandre went back to Paris to show his brother how to make clarinets. Thus his Alexandre clarinets were briefly made in Paris until they were discountinued. His design of clarinets quickly made Selmer clarinets a leading and wanted brand. FYI, some older Selmer USA horns had H&A on them. H&A stood for Henri & Alexandre. This line of Bundy horns has a professional heritage. They were precursors to the famous H. Couf line of horns. The specific model was H&A Selmer Bundy Specials and designed by Herbert Couf. Please see Bundy in the Couf/Keilwerth section. 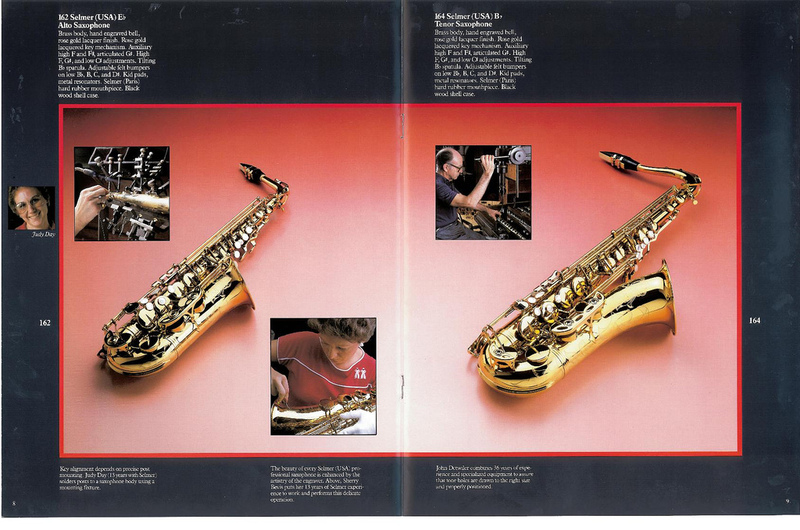 Selmer USA in the early 1980s introduced a line of Professional saxophones. 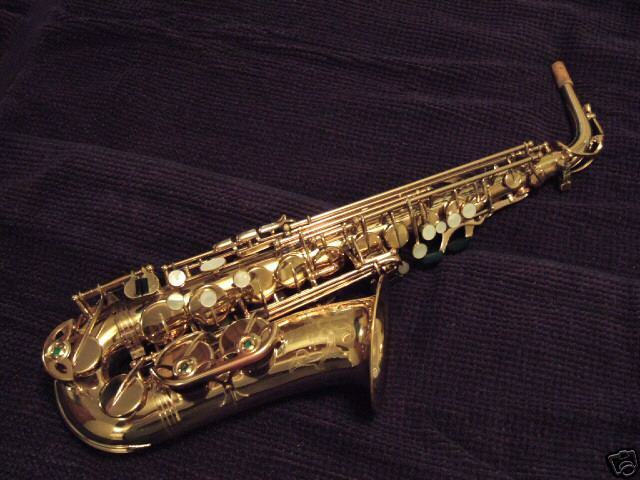 Initially identified as the Omega 162 (Alto) and 164 (Tenor), then later the AS100 (AS = Alto Sax) and TS100 (TS = Tenor Sax), and then the AS110 and TS110 models. Selmer(USA) Omega line of alto and tenor saxophones were superb professional instruments rivaling the Selmer(Paris) line. They have distinctly full bell engraving and may or may not say “Omega” on them, these are late 1970’s and early 1980’s models. Later Omega horns have less bell engraving and are not as desireable for Selmer USA horns, though they are excellent intermediate horns. Key indicators are the neck. If the neck support is a think ‘beam’ type it is the later model. If it is the type similar to Paris horns it is the desireable model; also the engraving is much more extensive on the earlier models. Anything with model number including MG is not their earlier pro horn..
From the early 1980s until approximately 2001 Selmer USA made their top-of-the-line saxes in Elkhart, Indiana. 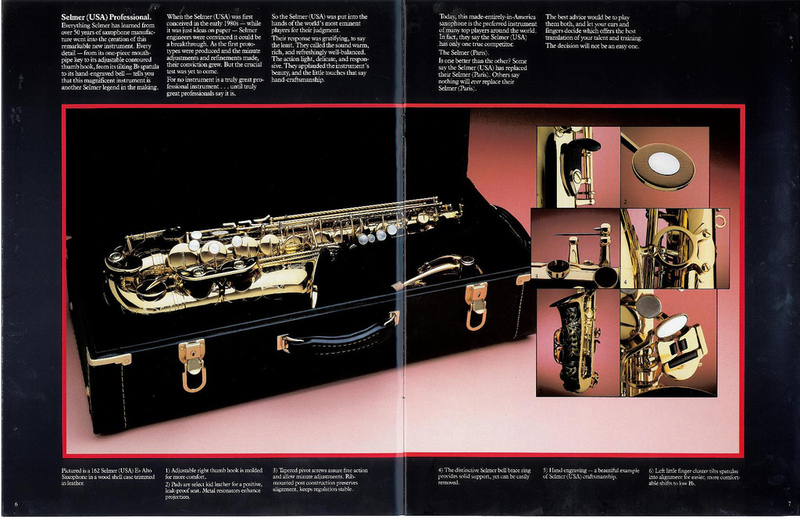 the The Model 162 Omega alto sax was the first model introduced. The Model 164 was the first tenor introduced around serial number 823000 (notice the lack of the “Omega” title. The model designation was changed to either TS100 or TS-100 when it was realized that professional players were not buying this “pro” line. The AS110 and TS110 started having corners cut to lower cost. Later horns used a different numbering sequence starting with 1xxxxxx (1 million +). 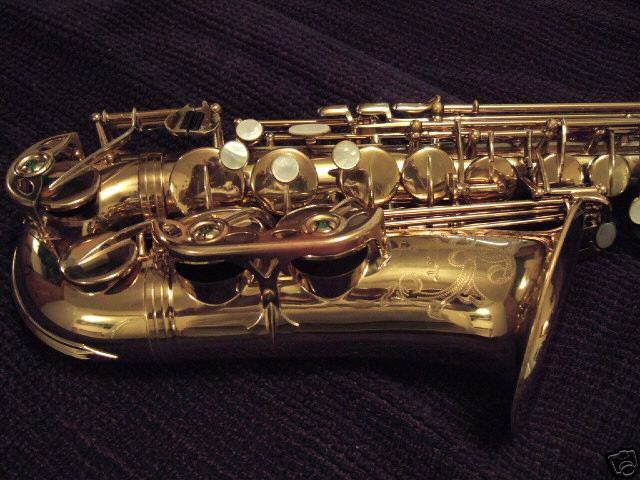 The early saxes had a dark lacquer and many Selmer Paris mk VI keywork styling. Later horns had brighter lacquer reminiscent of the Selmer Super Action 80 and late mk VIIs. Earlier horns had a brass high F#, later models had a pearl high F#. 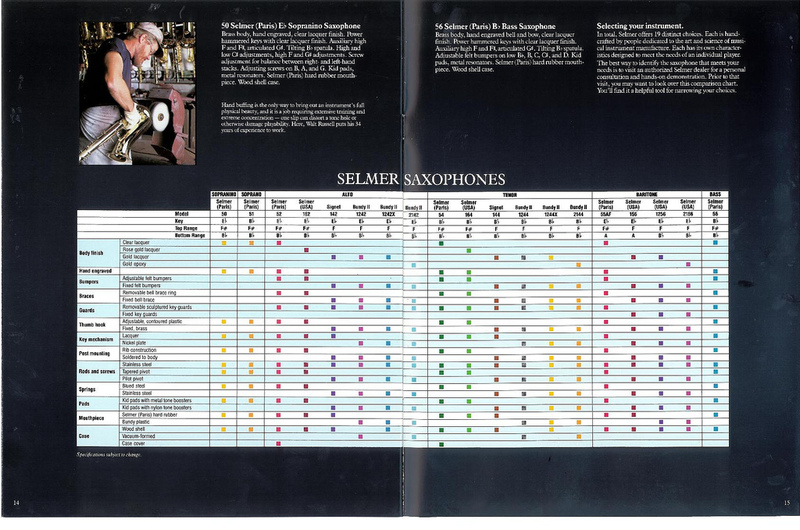 I originally explored the Selmer USA 1980s pro model of saxophones to see what similarities and dissimilarities there were with the Selmer Paris line of professional saxophones. There was a rumor that Selmer USA used to tooling from Selmer Paris. Just doing a 1-1 comparison of instruments this is totally inaccurate. USA & mk VII/SA80 use a heavy duty 3 point body to bell brace – the USA and Paris ones are visually similar though a comparison they are different.. The VI had a simplier 2 point design ring. Paris models have slotted posts for keyguards, USA uses a simplier system. Top of the body stiffiners are much more on the Paris horns, Body to bow & bow to bell rings are heavier gauge on Paris horns. Keywork specifics are different – lengths of segments of keywork, quality of finishing, etc. The USA horn was basically a copy of Paris horn using specific parts that they had or made for this horn. The real test is does the USA horn have the “core” sound of the paris horn. All of these early horns were apparently hand soldered like their Paris cousins. Later models (100s & 110s) horns used more automated procedures such as induction soldering and less precise key fittings. Notice the round RH side F# pearl, ovalized pearl high F#. The Body/Bell brace is distinctively mk VII and not mk VI. This design was carried forward to the SA80. The neck strap loop is distinctively thin compared to Paris. The RH side keys are distinctly mk VII like. The pearl touches are smaller than Paris. Engraving: Notice the engraving is only around the emblem. No engraving on the bell front nor bow. Emblem: The emblem is a stamp. Engraving: Very nice engraving on the bell only. Serial Number ranges: 824xxx through 829xxx (need confirmation). Engraving: Notice the engraving is not only around the emblem, but all around the bell and front part of the bow. Emblem: The Emblem is engraved, not stamped. Serial Numbers: 83xxxx and higher, Later models have a neck brace and 7 digit serial numbers. Identifiable by the elongated pearl RH alternative F# key; the bent brass high F# key and the AS/TS110 stamp on the bell. Also notice the neck stiffener under the neck which is smooth and does not have a crease like the Paris horns. At this point Selmer USA lowers the overall quality of the instrument. The neck socket uses a cheaper version with the music lyre being separate about 3 inches lower. Engraving: Some engraving above the emblem, on the front of the bell and bow. This engraving is a bit more simplistic than earlier engraving such as the 100 model. Emblem: The emblem is stamped with the “AS110” model number. I need to see more specimens as I’m curious if maybe the altos were stamped and the tenors were engraved. Visual Modifications: Right hand alt F# pearl is elongated like the mk VII – this modification makes it easier to hit the F# touch. Selmer USA made a version of the Signet which was basically a Buescher 400 (after they purchased Buescher – the 400 line included ‘TOp Hat and Cane’; S5 & S25 models). This is a fantastic horn with a nice full tone and warmth.. It is mainly identifiable by the “S” shaped bell brace. Earlier models had ornate flower motif engraving, later ones no engraving. The Bundy came from the Buescher Aristocrat, basically the Buescher Big B was the “mold” for the Bundy. Same keywork, design, etc.